The love and passion for their music has never faltered. Re-charged and re-focused, Great White channels their raw, sweet and all-at-once dangerous sound into their soon-to-be released collection. 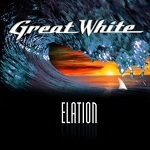 Set to come out May 18, 2012 in Europe and May 22nd in North America from Frontiers Records, “Elation” is the band’s 12th studio album. “Elation” thrives on Great White’s signature grit and blues-hued sound, only marked with a new synergy. Featuring co-founder Mark Kendall (guitar), and 28-year-veterans Michael Lardie (guitar, keyboards) and Audie Desbrow (drums), they are joined by lead singer Terry Ilous and bassist Scott Snyder the group emerged unscathed from late 2011 band member changes. Kendall, one of rock’s most notable guitarists, echoed Desbrow’s pure excitement. “The energy in the studio is amazing,” Kendall says. “This is the most excited I’ve been since I was nine-years-old and got my first guitar. It's remarkable to be doing our third record with Frontiers Records and to feel the love and support from Serafino and his team. They are truly part of the Great White family." Lardie, who also served as “Elation”’s producer, applauded the band’s teamwork in the studio. He was struck by the group’s song writing approach and enthusiasm, and assures fans will embrace the record. Look out for Shark Tales - The Tell All Book: 30 years of Rock and Roll and Great White rocking in a city near you in 2012! “Elation” tracklisting includes: (I've Got) Something For You; Feelin' So Much Better; Love Train; Heart Of A Man; Hard To Say Goodbye; Resolution; Shotgun Willie's; Promise Land; Lowdown (Bonus Track); Just For Tonight; Love Is Enough; Complicated.